Not content to meditate on destruction when I'd come to celebrate life, I made my way over to the bike shop and rode away atop a late model BMW F700GS that was perfectly suited for the next two weeks of mountain camping and riding. 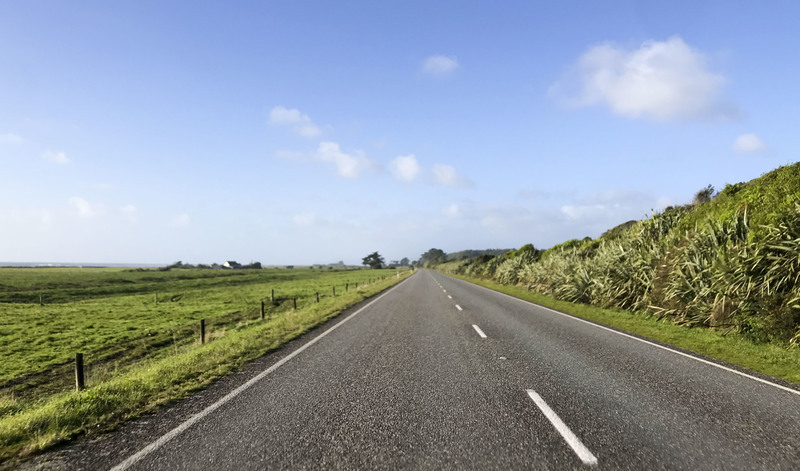 The ride west into the mountains from the coast starts deceptively flat, with tree-lined pastures chopped into orderly plots next to the road. Gradually, though, the steep hills in the distance become a winding road and I found myself again climbing. 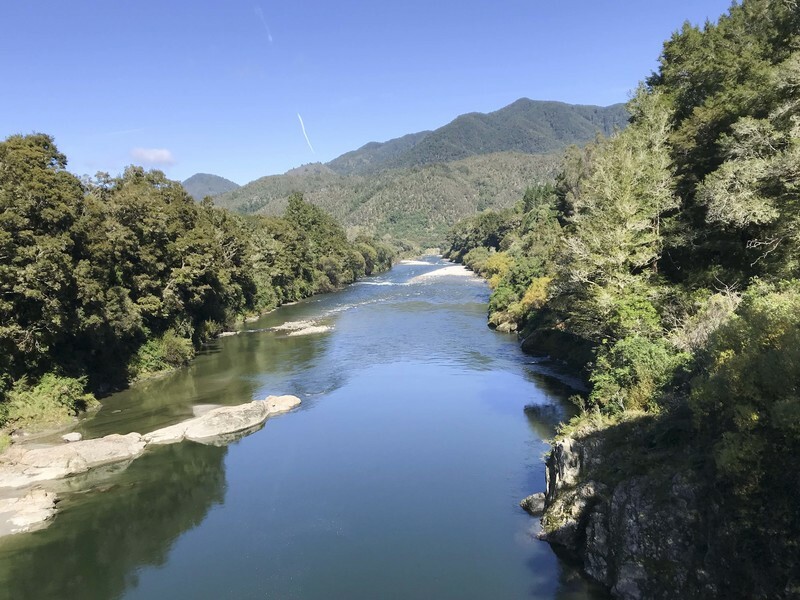 Unlike the North Island, where the mountains tended to feel more like isolated peaks, it was clear that the Southern Alps were a different sort of epic. They rose jagged and tall like the Eastern Sierras approached from the Nevada side in the US. Another hint of something special was crossing a large and fast-moving river which carried the milky color of glacial sediment. Riding into Tekapo, the mountains cupped the flat sparsely-vegetated basin in a way that made me long for the deserts back home. Tekapo is part of the Mackenzie dark sky reserve, where the crystal clear skies and lack of human-generated light make for some of the best star gazing in the world. 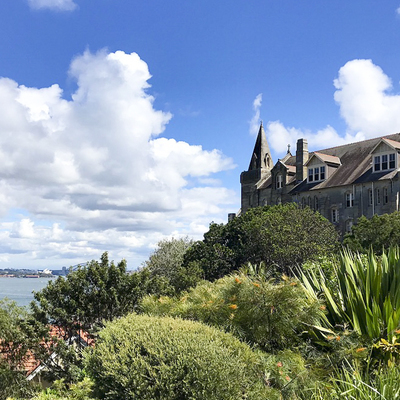 Arriving late in the afternoon, I paid homage to the Church of the Good Shepherd while battling hoards of selfie-taking Chinese tourists for the view. I turned off the main road and picked my way along a dirt road that wound along the lake, past the Mt John Observatory, and into the campsite at Lake McGregor. The temperature was cool but the light was perfect along the way so I slowed down to savor the view. 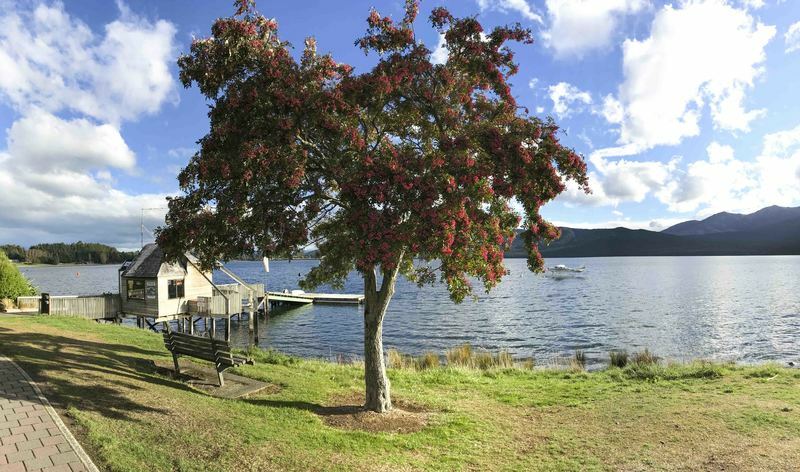 Campsites in New Zealand were much more crowded than those in Australia. In fact, finding lodging of any sort was significantly more challenging and more expensive than anywhere else I'd been, despite the lateness of the season. 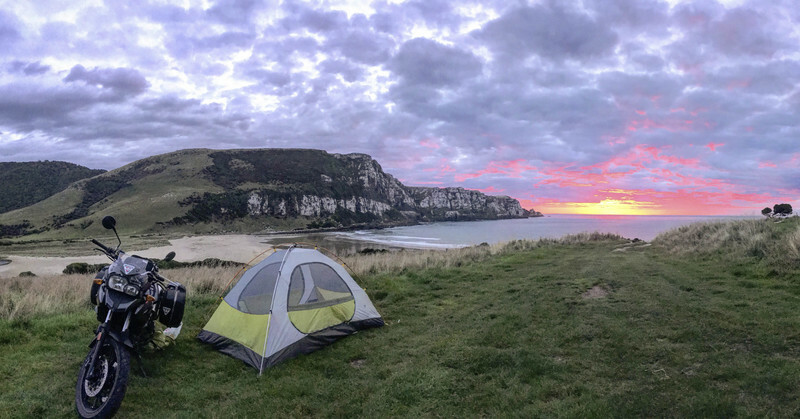 Whereas in Australia I could comfortably roll into a campsite late in the evening and expect to be one of just a few people, in New Zealand I had to make sure to arrive well before evening and make bookings at least a few days in advance or risk being shut out of a town entirely. 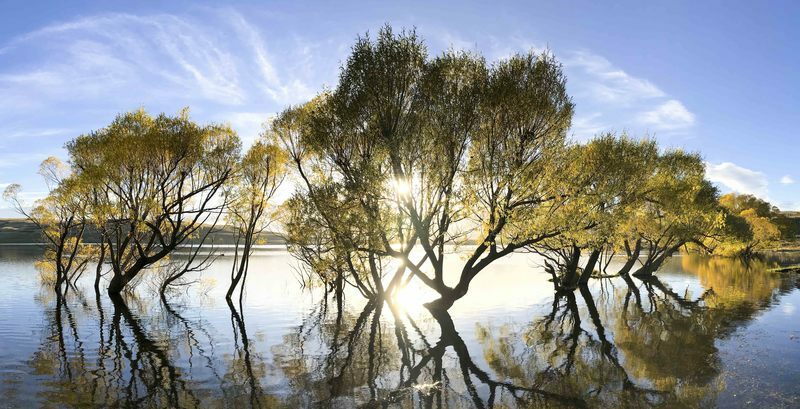 The next morning, I awoke at dawn for a swim in the lake and found the flooded trees afire with the early morning light, which reflected on the water in a way that spoke poetry. 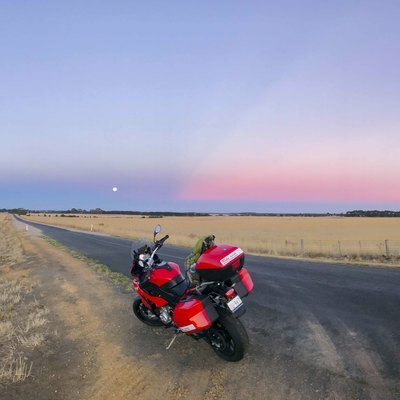 Riding out into the morning was accompanied by one of those rare and precious feelings of pure connection with the land around and a sense that time had dilated to surround the moment without a hint of hurry or scarcity. I followed the road along the edge of the mountains but never turned all the way in. My destination, at the recommendation of a friend, was back along the coast. It was a tease to travel right next to such an alluring set of peaks and then turn away but I would return soon enough and had plenty of countryside to explore. 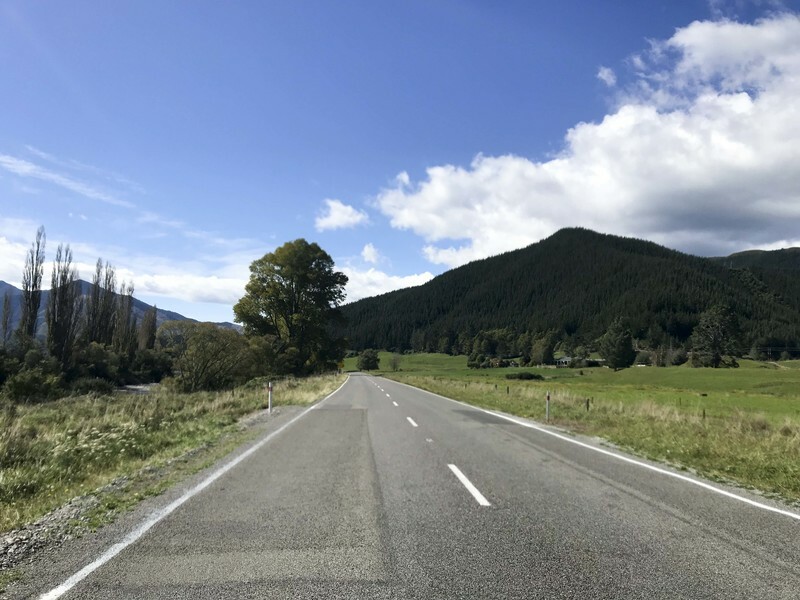 I skipped right up to Cromwell and then continued down along the Cromwell Gorge towards flattening countryside and more farmland. One of the few discordances I felt on the trip was a nagging sense that the land had been overdeveloped. I (clearly) can't get enough of traveling through rolling farmland and pastures but there seemed something almost sacrilegious about the way that the forests I passed had all been logged into neat rows and the herds of deer that roamed the plains did so within the barbed-wire boundaries of clearly defined plots. Maybe it was a function of how close to the surface the voice of the land seemed to be that the impact of man's transgressions felt so stark. Still, as I traveled along the dirt road towards the sea, I couldn't help but marvel at the beauty of it. 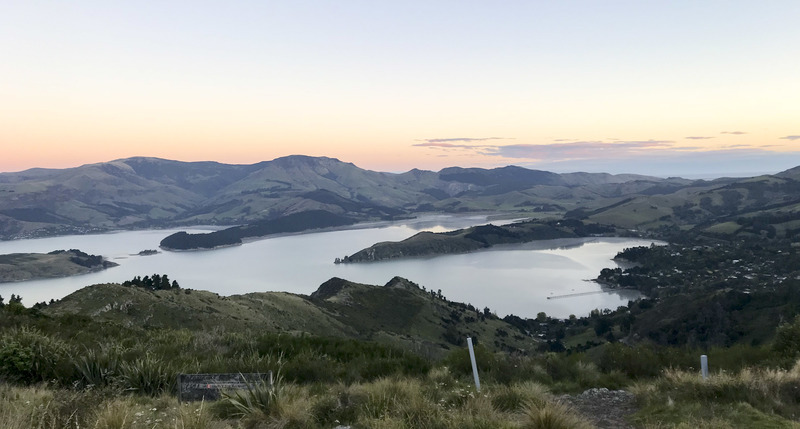 Though I'd seen a lot of amazing sights, I was entirely unprepared for the shock of delight that hit when the hillsides opened up and revealed the sheltered basin of Purakaunui Bay. 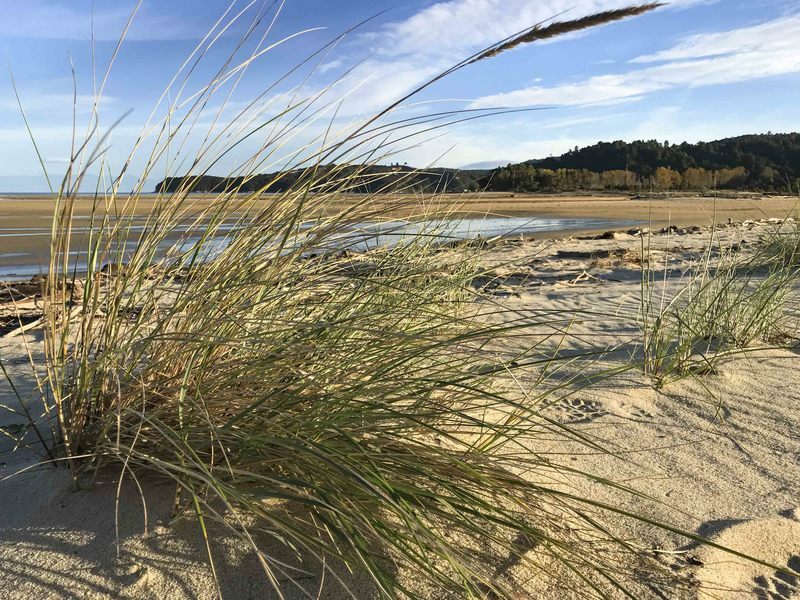 It was bordered on both sides by steep bluffs and the air hung redolent with the scents of lightly used pastures, dirt roads and the unmistakeable brine of the sea. The campsite was half along the beach and half directly in the sheep pasture that bordered it. Surf boards rested against the camper vans who had clearly spent some time there while people lazed the late afternoon away, staring into the waves of the South Pacific in the setting sun. 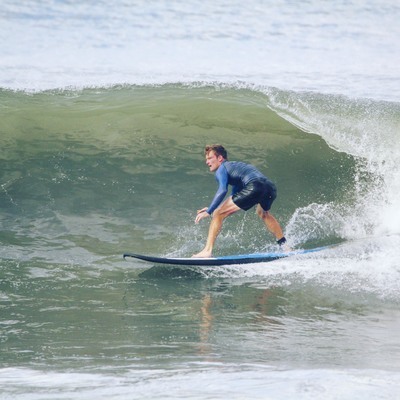 I found a place to stay atop the bluff which overlooked the surf and went for a swim in waters that were roughly as cold as you might expect this close to Antarctica. Dawn set the horizon afire like an eruption that scattered molten clouds across the dome of the sky. Few sunrises I've beheld have carried forth such an energy. Though I seriously considered staying for several days to soak in some of the best energy I'd had all trip, I was excited enough to get back into the mountains that I regretfully packed up and hit the road again. Though the wind was in my face the whole time and my ear plugs weren't working nearly as well as I would have liked, the sight of the mountains ahead kept me pushing. I silently thanked myself for stopping to pick up some fleece pants and a hoodie a couple of days before because it was clearly no longer summer outside. I arrived in Te Anau battered and cold but thrilled to be back among the deep lakes and savage peaks of the Alps. One unexpected boon that came with the cool air was the onset of the Southern Hemisphere's Autumn and all the smells and colors it brought with it. I was again transported back to youth in New England by the smells of wet leaves and the sights of trees dusted with vibrant red, yellow and orange. I met some friends in the lodge and we set off early the next morning for the Milford Sound. Known as one of the wettest places on earth, the treacherous roads and high winds made it hellish for a motorcyclist so I was grateful to take a place in their car for the 2 hour journey through the mountains into the pre-dawn darkness. We crossed through wind and rain as the light slowly rose to reveal a twisting road that cut through steep ravines bursting with waterfalls. The rain and mist gave a surreal impression as the cliffs separated themselves slowly from the mist to coalesce into view and then blended slowly back as we passed. We took a ferry into the bay and I couldn't help but be entranced by the sheer volume of water that cascaded off the cliffs and into the sea below. It shouldn't have been surprising in a place that averages 182 days and 6.5 meters of rainfall per year. But the gossamer strands that draped the mountainsides and framed the larger torrents looked like spiderwebs caught in a giant's green beard. As the journey continued, the rain stopped and the clouds peeled back to reveal a different character of the sound. 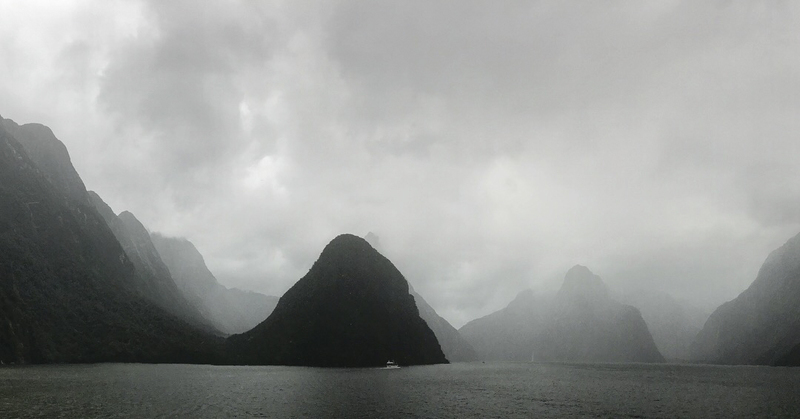 Though cold and wet (not least because the ferry deliberately parked beneath a waterfall for a stunt), being among such an unusually stark and vibrant landscape was undeniably energizing. The way back, though we traveled the same road as we came in on, was like a new experience due to the sunlight that now bathed the sidewalls. Curious to get deeper into this landscape, a couple of us stopped to do the Key Summit Hike and caught a breathtaking view of the ravine from above. Wanting to soak it in, we stopped to meditate. The way back also gave clear validation to my caution in taking a rental car -- we saw not one but two cars flipped completely upside down by the side of the road, recent wrecks that stood as silent monuments to an unknown violence. 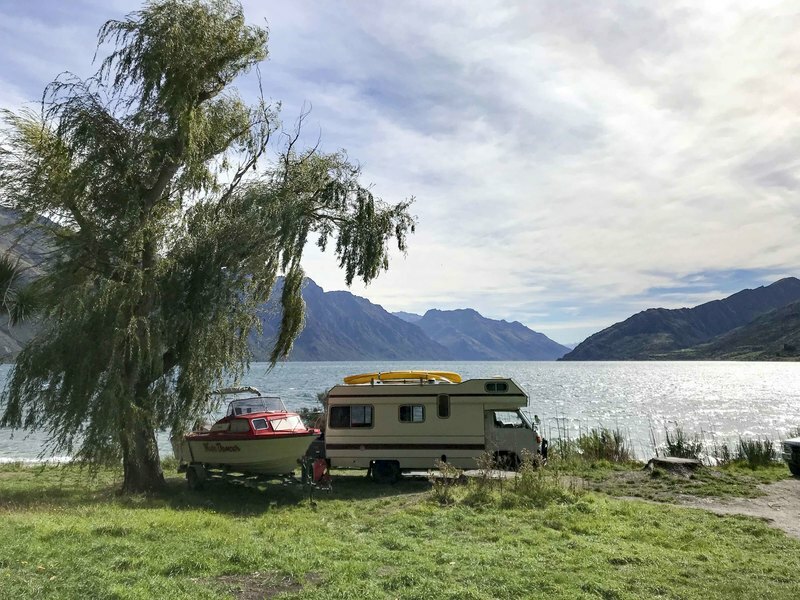 After parting with my Milford-mates in Te Anau, my own route took me back north towards Queensland along the breathtaking Lake Wakatipu. 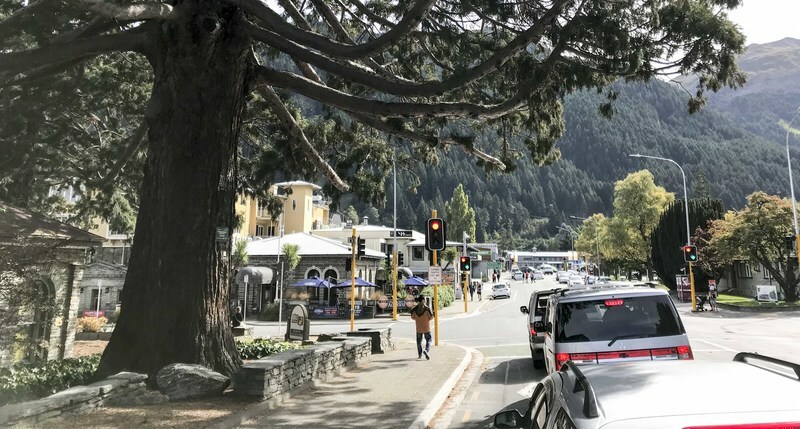 Queenstown itself is as close to a perfect resort town as I've ever seen. 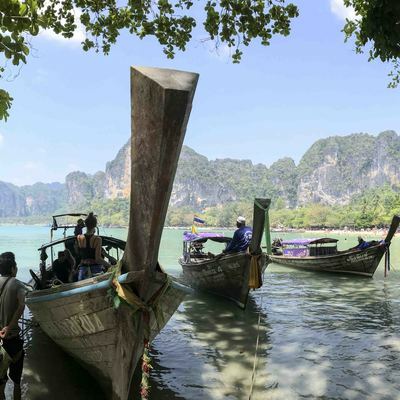 The region is strongly reminiscent of Tahoe, cupped in the basin of the mountains and settled against a picturesque lake. The town is a bit larger and more developed than those around Tahoe but has a familiar preponderance of pine trees and fresh mountain air. You can find every quaint little pizza parlor, gelato shop, cafe or restaurant you might crave during your vacation in the mountains. And the view along the water is one to savor. 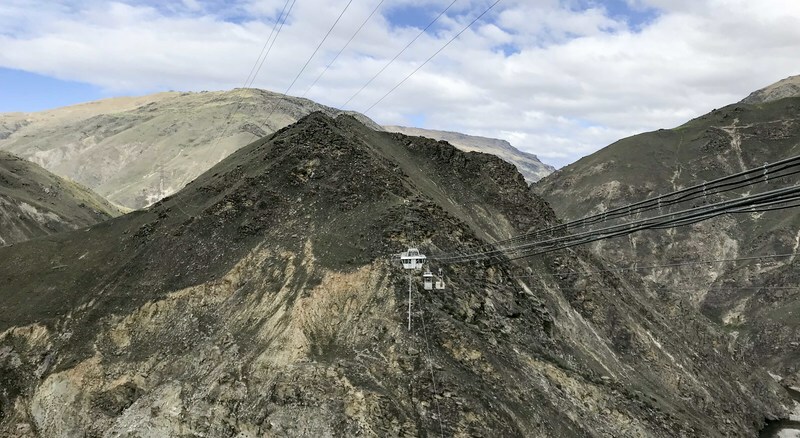 Not content to play passive tourist, I ventured through the Kawarau Gorge and went bungy jumping at Nevis, at 134m the highest such location in the world. 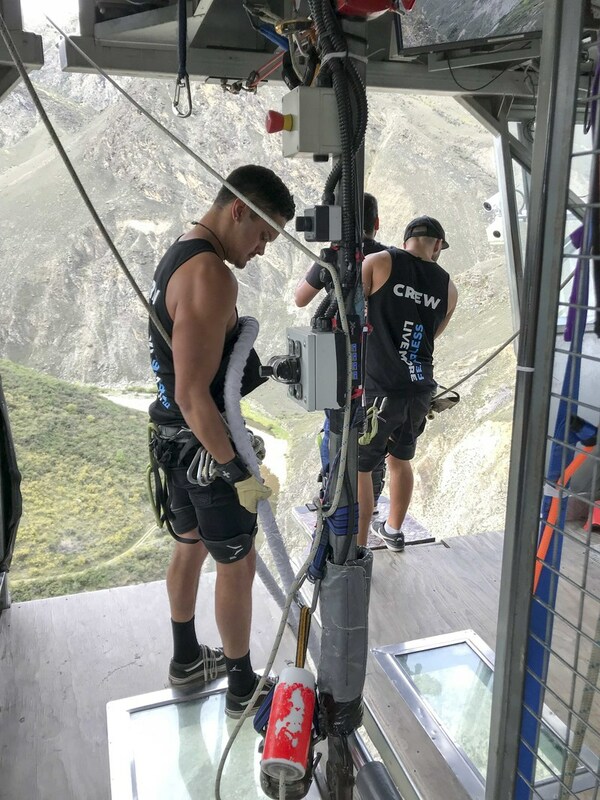 I'd built up an expectation for bungy jumping over many years, ever since my first sky diving jump was surprisingly (and a bit disappointingly) easy. I figured that staring down at the ground rushing up at me would have more of a terrifying -- and exciting -- effect. Alas, it was not to be! The people at AJ Hackett are pros at making sure their charges have no time or opportunity to think and get scared, likely out of a long experience that let them associate such thought with freak-outs and delays in their operation. Pretty much everything -- from the loud music in the small vessel attached to the cables that spanned the ravine to the many meaningless questions asked by the people preparing me -- is geared to distract. So, against my hopes for stepping to the edge and really soaking in the fear of the moment, I was hustled out and over without much chance to get myself in the headspace to savor it. The freefall was interesting and I was surprised that the head rush came on the first bounce rather than the initial fall but ultimately I never felt any fear. Aah well, I guess I'll have to keep searching for something that gives me the same kind of adrenaline-fueled sense of flow as track racing did in Texas. The video is pretty cool, though. Having accomplished my "extreme sports" goal for the day, I continued back through the gorge. The region's history, as with much of Australia and New Zealand, had been heavily influenced by the gold rush and it was pretty cool to see some of the old equipment still scattered about. I spent the evening at an AirBnB taking care of some work things and soaking in the view as autumn kissed the forests around the lake below. 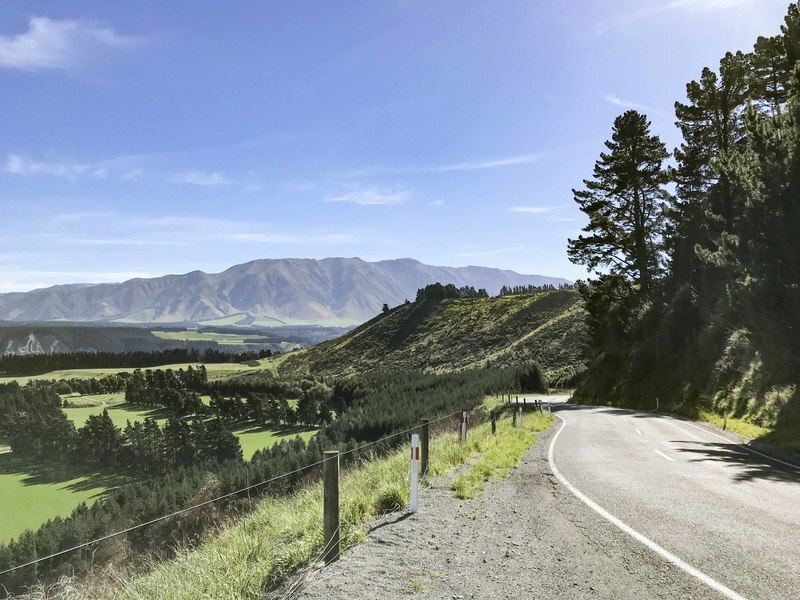 The ride from Queenstown to Wanaka was one of my favorite of the whole trip. 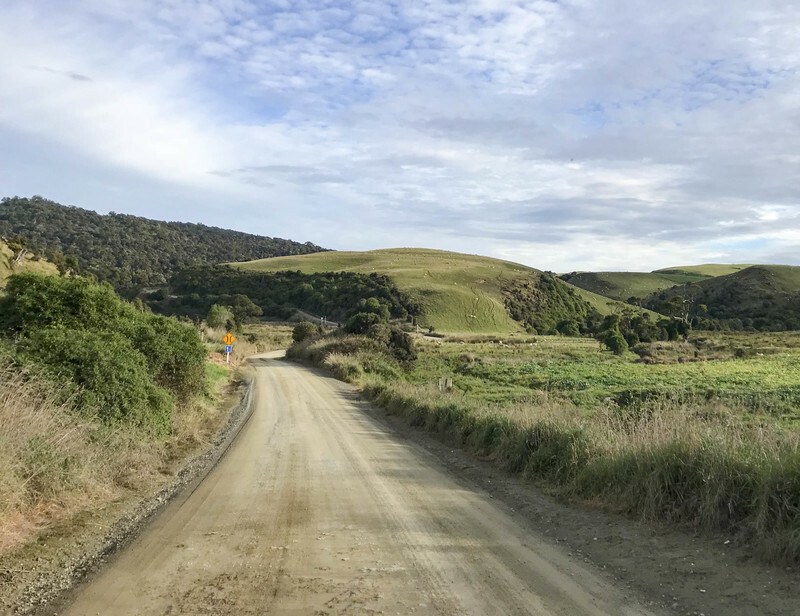 It took me through the high country farmland that I've come to love but also mixed in gorgeous alpine vistas, autumn forests and quaint old mountain towns like Cardrona, a place that really captured my heart. I don't even have good photos of this leg because I was so in the zone of the ride. The high mountain valley that ran between the peaks of the mountains is a special kind of paradise in my world. With some extra time on my hands and such a good ride already behind me, I overshot my night's destination and continued deeper into the mountains for a late afternoon ride along some of the best scenery there is. 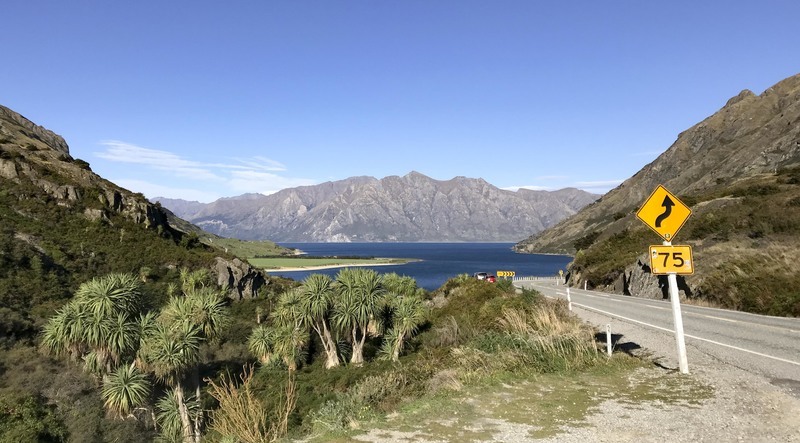 The road along Lake Hawea, through The Neck and continuing up Lake Wanaka is a delicious blend of open-throttle sweepers and cresting views that stretch for mile after epic mile of steep mountainsides and deep blue waters. Buzzing with the thrill of another great ride, I stopped to hike into the famous Blue Pools, where the natural confluence of two rivers created deep glacial eddies and resulted in a sheltered spot where it was possible to swim on a hot day. 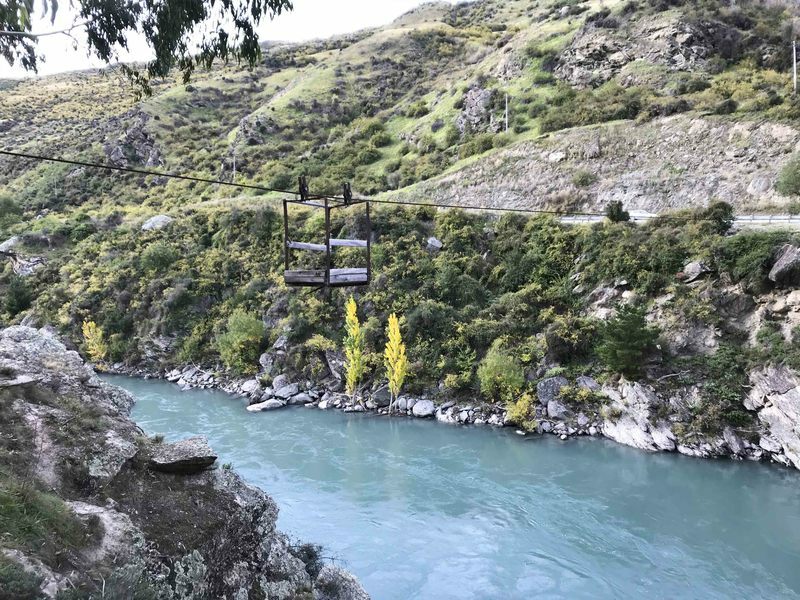 Given that it was early in a cool evening, I opted not to partake but that didn't stop some people from jumping off the precariously shaky suspension bridges. Returning the way I came, I pulled into the town of Lake Hawea for the evening and settled in to enjoy the view before the biting wind which whipped the shores to a choppy froth encouraged me to seek the fire inside. 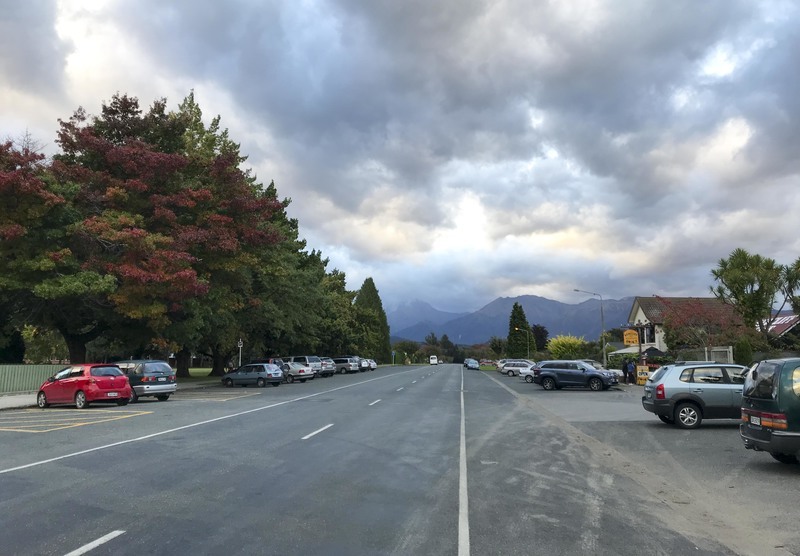 The following morning I backtracked slightly to Wanaka, another mountain town that's tucked between tall peaks and adjacent to a deep lake but which has a more casual vibe than Queenstown did. Eager to get some exercise after several days in the saddle, I rented a mountain bike and took on some of the trails along the lake of the same name. In the high mountain air, the autumn leaves were in full force and the ride was almost surreal in its beauty. After a good hard track that wound along the bluffs and through the forest, I returned to the lake to enjoy the view. The wind coming off the mountains was so strong that it created white caps which crashed into the shore with a sound like the ocean. Finding a sheltered spot, I took in as much as I could and overflowed with gratitude. 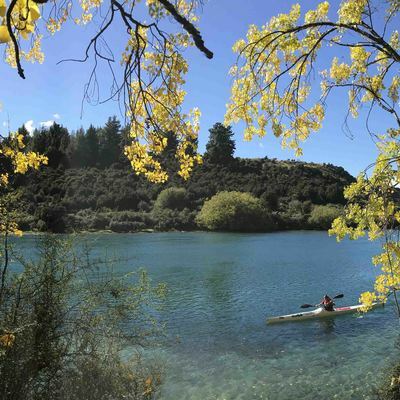 I would have loved to stay in Wanaka as well, but my trail took me back north and west through the mountains. 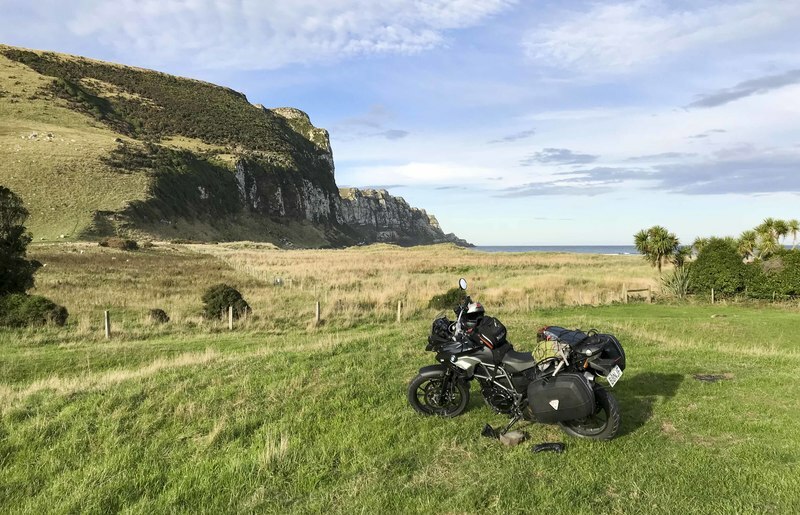 Geared up with every warm layer I had and feeling like the marshmallow man astride the motorcycle, I set off in the early morning into the Haast Pass through the mountains and to the Tasman Sea. Early on, the pass lay covered in cool mist which hugged the damp pavement and made me concerned about further rains. But as the morning drew on and the sun rose higher, the mists rose and revealed a perfect mountain road that twisted through high peaks covered in thick forest and sharp valleys colored the pulverized gray of glacial moraine and cut through by pale green rivers. Once again, my route took me along the sea, this time up along the western coast. 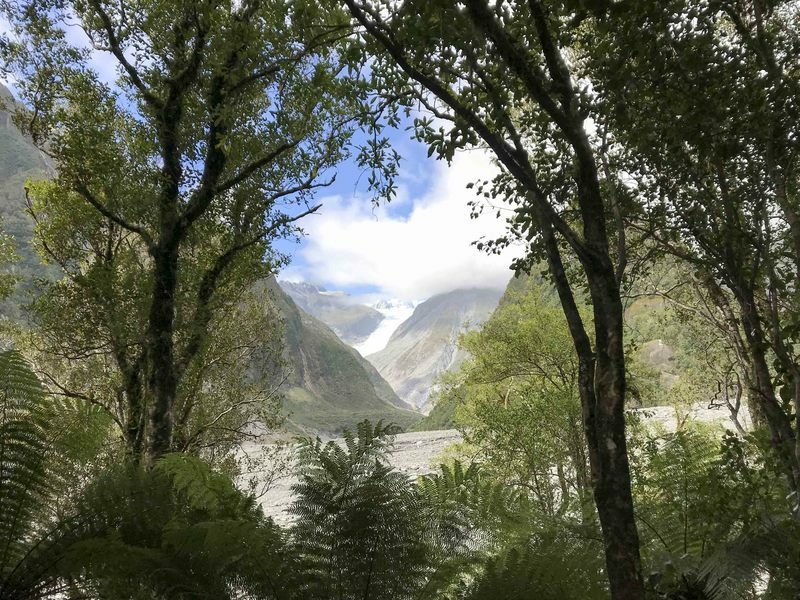 Seeing the telltale blue-white mass atop the distant mountains, I took a detour and hiked out to observe the Fox Glacier. The road along the coast ran for long stretches parallel to the sea before cutting inland and winding through the foothills. As ever, short fences kept the herds of sheep well contained and family farmhouses lent a pastoral charm to the valleys. I couldn't help but think that if it wasn't on the other side of nowhere, this area would be one of the most popular places to settle down on a plot of land in the world. 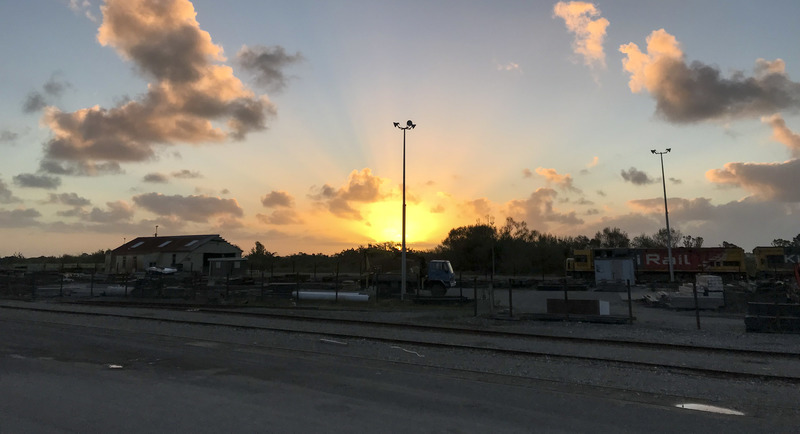 I spent the night in Greymouth, with just under 10,000 people the largest town on the west coast and a relic of the coal and gold booms of the mid 1800s. Its history was writ in the squat industrial buildings, the tangled strips of railroad tracks that passed through and the scented pall of slightly acrid, slightly sweet coal smoke that hung over the region. The smoke left just enough particulate in the atmosphere to fire the sunset with an extra hazy blur. The morning's ride towards the north coast began under cool mist and carried into the mountains as it slowly rose. The road cut into the mountains, where a descent into a valley would reveal the thin wisps of coal smoke rising lazily from the handful of chimneys that marked its village. Just as quickly, the ascent to follow would carry along forested grades that crossed steep ravines and smooth rivers. 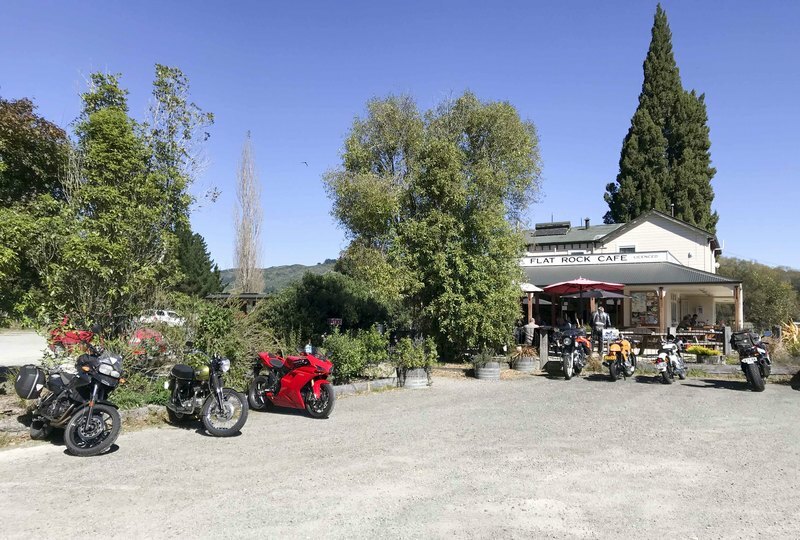 By mid-day, I was again trodding a well-known motorcycle track and stopped off at the Kohatu Flat Rock Cafe to join my brethren and warm up in the sun. 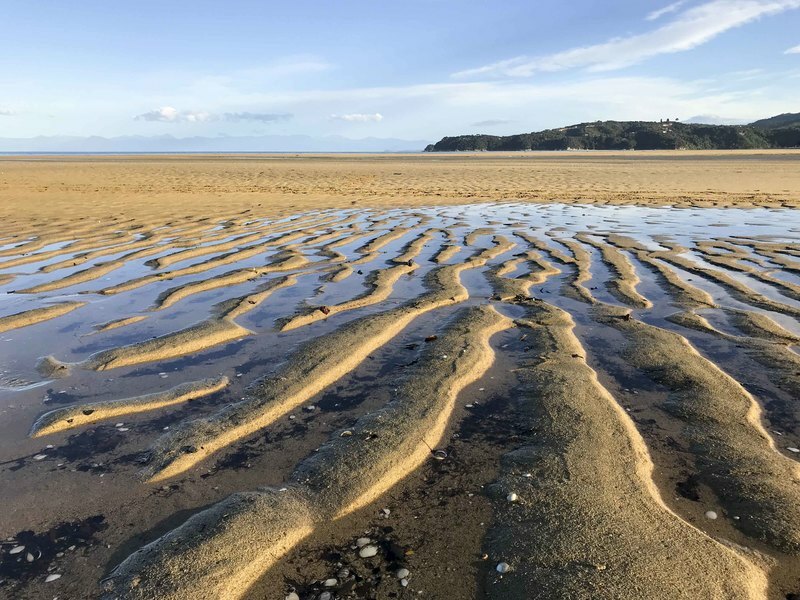 Gradually, mountains gave way to hills and the hills flattened out towards the sea as I hooked north from Richmond towards the Abel Tasman National Park. One of the Great Walks of New Zealand took place along its shores so I was curious to catch a glimpse of the coast. 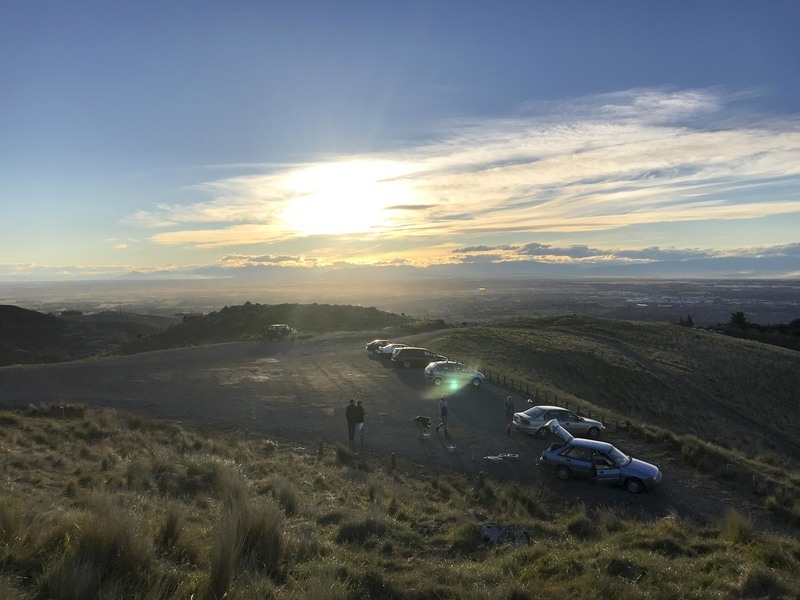 I arrived in Marahau at sunset and had a run down the trail to satisfy my curiosity. 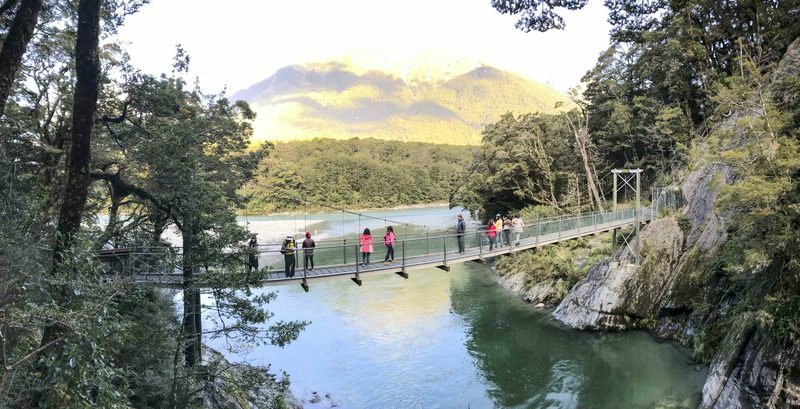 The 10 Great Walks of New Zealand are extraordinary multi-day hikes through various National Parks which are specially curated due to their popularity. They have hut facilities that you need to book many months in advance but represent the very best the country has to offer. 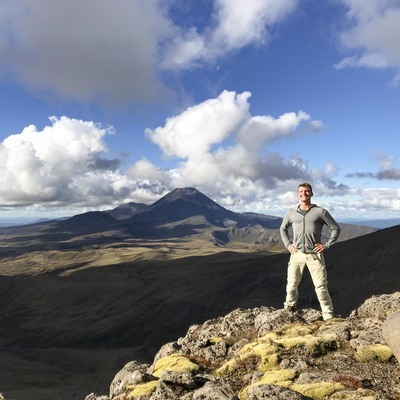 Despite a few glimmers of hope, I wasn't able to snag any last-minute campsite openings to stitch together one of my own but the single-day Tongariro Crossing hike I'd done on the North Island was actually part of the Tongariro Northern Circuit Great Walk so at least I got a taste of what was on offer. My circumnavigation of the island was drawing to a close and the next day was destined to be the most challenging. 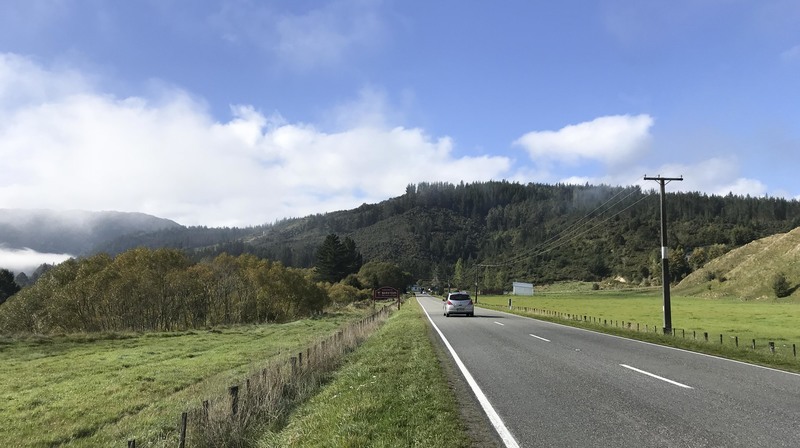 My original plan had me hooking around the north at Blenheim and then lodging somewhere mid-coast before an easy last-day ride back down to Christchurch. I started the day assuming as much, casually picking my way along the coast and swallowing my indignation at having to deal with actual traffic once again. The opportunities to cut inland and sniff out mountains kept me in good spirits as the clouds began to coalesce. 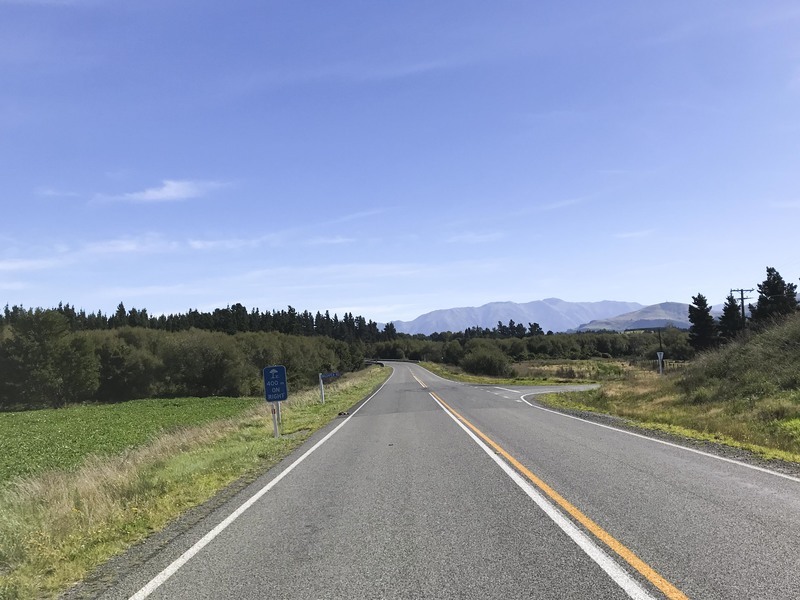 After hooking south from Blenheim, I was informed that the road towards Christchurch was only open for certain hours of the day due to damage from the earthquake that had struck over 7 years ago. At the same time, the weather turned sour and, for the first time in a trip where I'd strategically avoided any hint of real rain, I had to don the rain suit and suffer through the biting chill of drizzle. Even worse, over 50km of the road was under standstill construction. The pavement was replaced by a torn-up soup of gravel and mud crushed down by the tread of hundreds of construction vehicles who worked tirelessly to rebuild the bluffs that overlooked the angry sea. An endless series of stops for one-lane roads and to wait out construction activities sapped my energy and the constant wet kept me frozen in the saddle. Despite this, I skipped my stop off in Kaikoura. The town didn't look particularly inspiring in the early-evening gloom and somehow the granite core of endured suffering left me unwilling to unclench those muscles only to have to re-engage them the following morning for the final leg home. Instead, I powered through the miserable wet and poor conditions to return to Christchurch after 500km and 12 hours in the saddle. In need of a pick-me-up to close out the last day of my trip, I met up with a couple of entrepreneur friends who had been at the DC Gold Coast event a month before and, natives of Christchurch, they took me for a journey into the surrounding hills at sunset to reveal the more tender side of what I had written off as an uninteresting town. A great view, good company and an overkill of sheep jokes did wonders to shake off the misery of the previous day's ride. 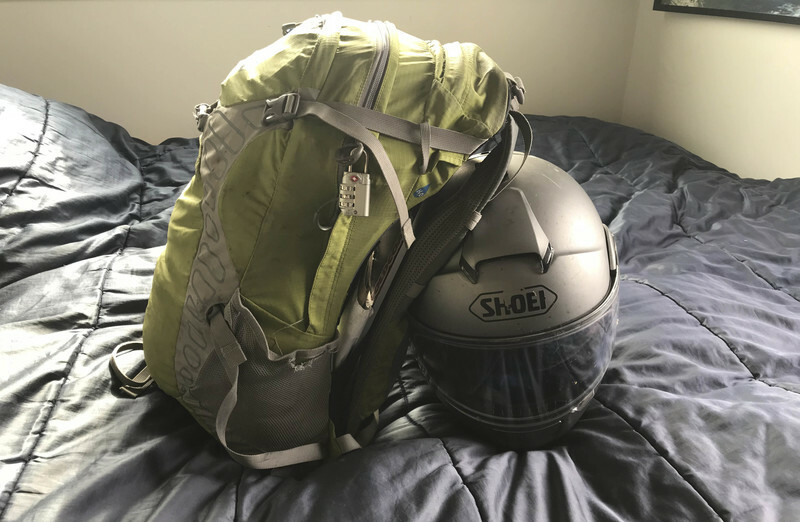 Early on the morning of the 9th, I headed to the airport and, for the last time, hacked my way through gate security with the helmet and backpack tightly packed to avoid the expense and risk of checked baggage. 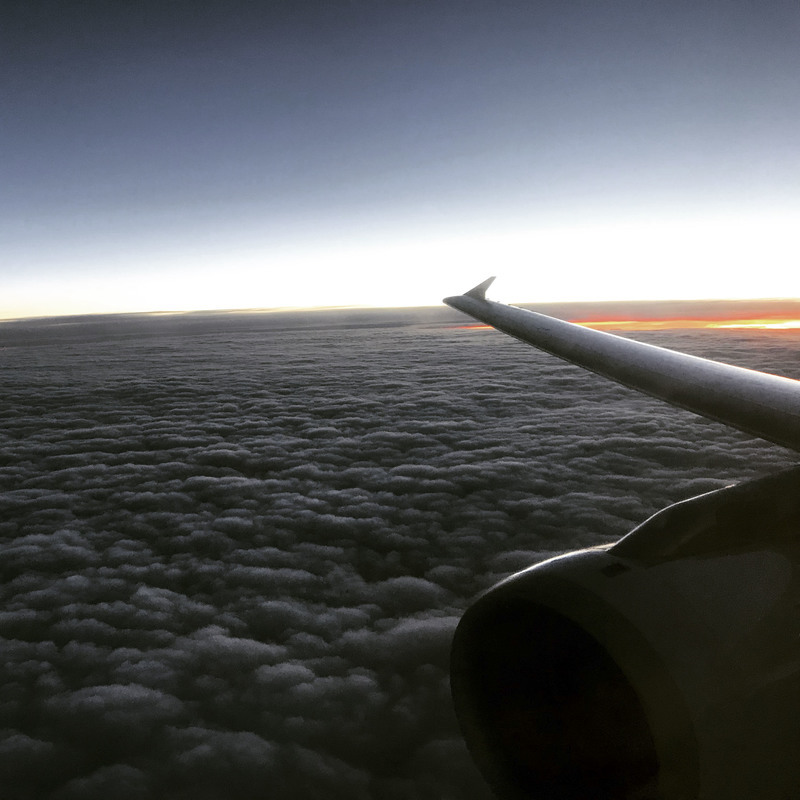 One hop racing the sunrise into Sydney and then I was on my way back to San Francisco for the first time in 100 days. 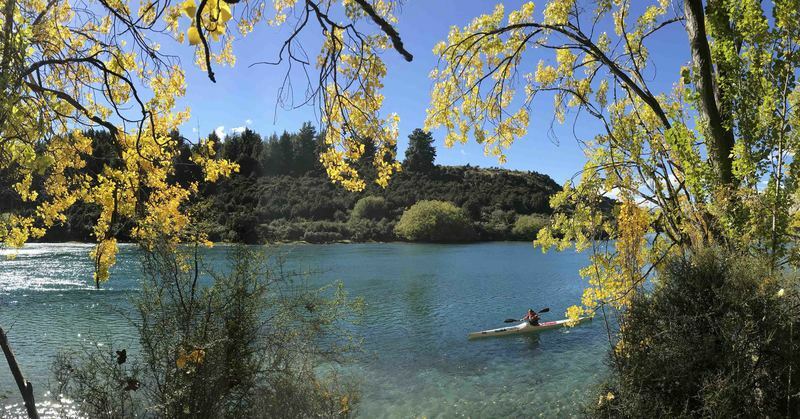 It feels almost too large to package the whole trip into a conclusion that viably captures the complexity of all its edges but I can certainly bring some clarity to my experience in the South Island of New Zealand. Expecting the world, my expectations were only exceeded. This place is incredibly beautiful. Yes, the roads are filled with beaten up old camper vans and the campsites are crowded because those same camper vans in the past had made such a mess of things that it caused the local population to essentially revolt and ban them from most locations. Yes, everything from food to lodging is incredibly expensive. And yes, the weather can be a real pain to work around. But nothing can take away from the awe-inspiring beauty that makes this the most densely gorgeous place that I've seen on earth. As with Australia, I don't think I can say that I discovered a place that I see myself feasibly inhabiting for many years. 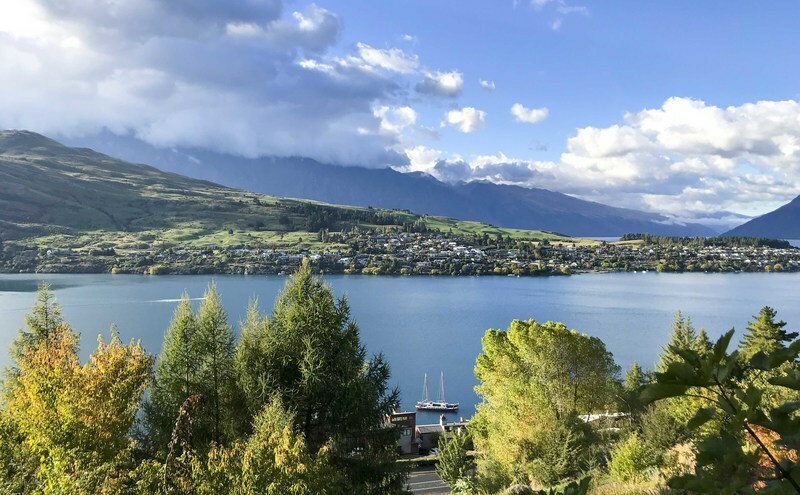 But the Queenstown/Wanaka area is absolutely the top of its kind and I'd gladly spend more time there or even, perhaps someday, figure out how to bring a family over for a bit longer. 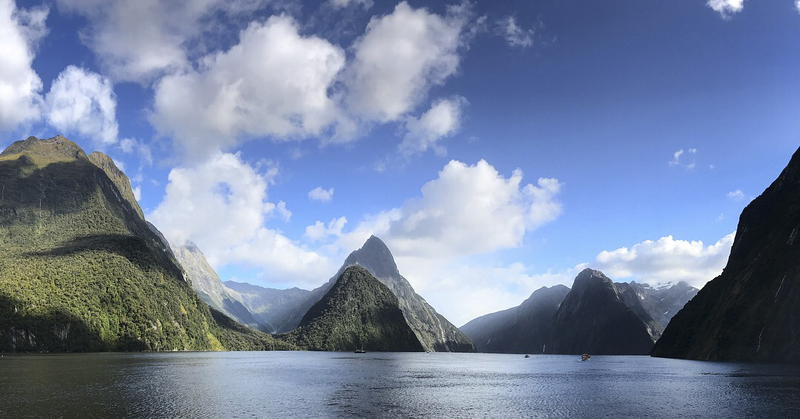 For the purpose of the trip, New Zealand was a victory lap. I experienced such different things amidst the challenging extremes of India, the opposing ends of Thailand, the relaxation of Bali and the wide-open freedom of Australia that my cup of life was already full. I didn't get all of life's questions answered but I found the spark of enthusiasm that had been buried under so many years of professional overextension. It has been exciting to return from a journey across the world to a life now open with opportunities. I'm immensely grateful to have had the experiences I did and am thankful for everyone who I met along the way and who supported me from afar. The hardest thing about traveling alone is the loneliness of not having someone to share the best and the worst with. You've all made it easier so thank you. For now, it's time to trade the backpack for a laptop and step into the next phase. But I won't keep it far because it's bound to see some use again soon.